There once was a very damp cave, which housed a cavern for the bold and the brave. But then, one night, to everyone’s, delight, the cave was transformed into a rave. Want to know more? 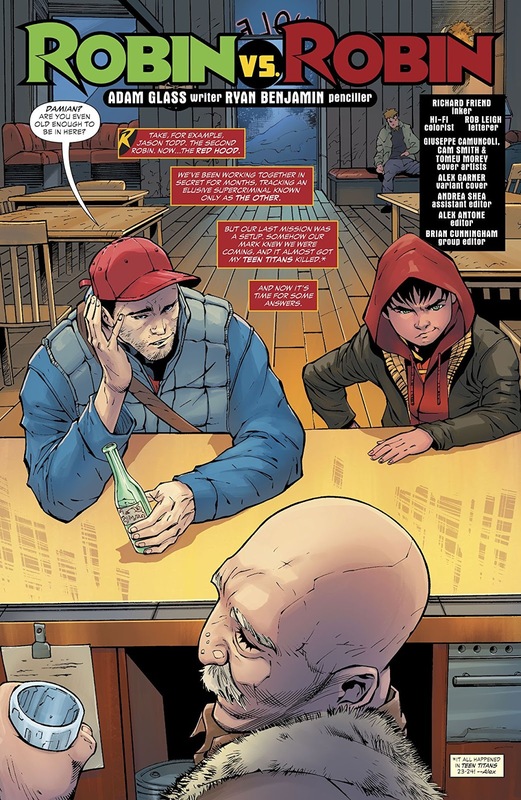 Then please ignore the following adventure created by Adam Glass, Bernard Chang, and published by DC Comics in February, 2019. TO QUOTE Diogenes: 'The great thieves lead away the little thief'. 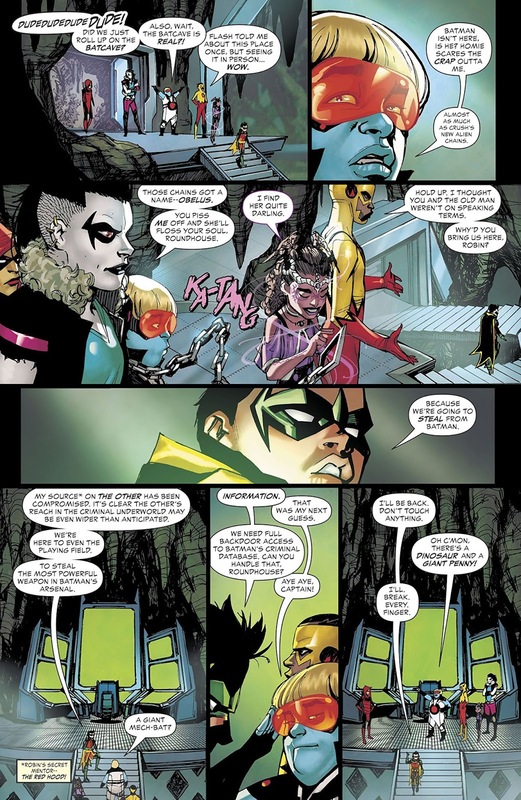 In order to continue their crusade against The Other, both Robin and the Teen Titans venture down into the Batcave so they can set-up a remote connection between themselves and Batman’s mainframe computer. Part One) IT’S GOOD TO BE BAD: Have you ever wondered why someone with a dark heart would want to do good things? I have, quite often in fact, and each time I think this, I can’t help but try to figure out if ‘anti-hero’ is the correct way of defining this type of personality. After all, what is an anti-hero? Practically, I mean. Does it have something to do with a good person doing bad things? A bad person doing good things? Or is it someone who gives the impression of being bad, but is good, deep, deep, inside? Or vice-versa? Either way, there’s a definite grey area in regards to this particular breed of bipolar hero. A grey area, I hasten to add, which also makes me think about the Teen Titans. Well, let’s be honest here, out of their roster, who would you say is a full-on anti-hero? Personally, Damian would be at the top of my list, Damian Wayne (a.k.a. 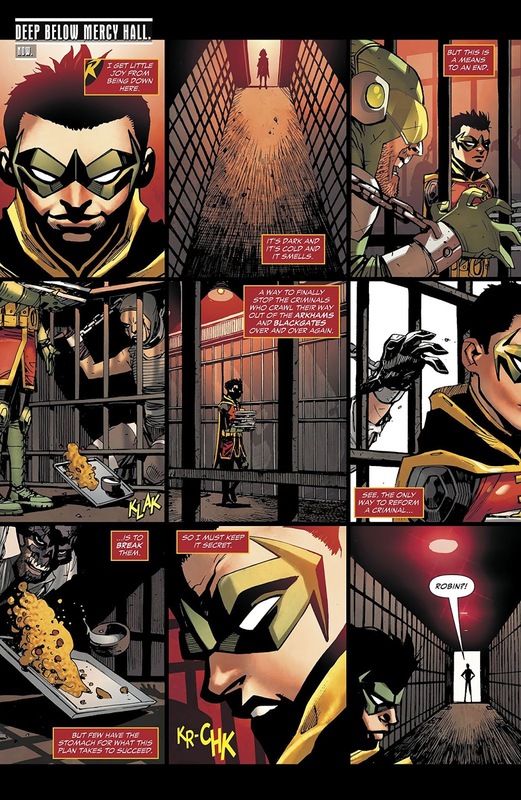 Robin: The Boy Wonder), largely due to his chequered dual heritage and some of his past transgressions. Next up would be characters like Red Arrow (Emiko Queen), Crush (Xiomara Rojas), and Djinn (whatever she’s called), simply because these three ladies give off the impression of being bad, without actually doing anything murderous, corrupt, or vile. And last, but not least, there's Kid Flash and Roundhouse, otherwise known as Wallace West and William Wu, who are two teens that aren’t anti-heroes at all. If anything, they’re slightly delusional teenagers at best, who’ve been dealt a bad hand but know what's right from what's wrong. So, with all that said, we now have to ask ourselves the all-important question: Should the Teen Titans be labeled as a team of anti-heroes? And if not, why not? Keeping in mind that the DCU and MCU have both been populated by this breed of hero ever since the early 1980s, and during that time, their popularity has either risen or fallen depending on their reputation or the prevailing social climate. Well, once upon a time, the comic book industry was swamped with a deluge of anti-heroes, such as Deathstroke: The Terminator, Namor: The Submariner, Grifter: From the WildCats, Wolverine: From the X-Men, along with Deadpool, Catwoman, The Punisher, Red Hood, Spawn, The US Agent, Harley Quinn, and many many more. So, as you can imagine, being an anti-hero isn’t anything new to today’s comic book industry. 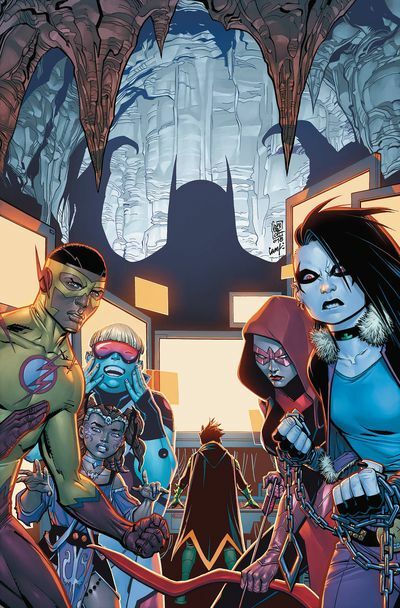 But what is new, dear reader, is that the Teen Titans have decided to join their roster. Now, if this will stick, permanently, for a prolonged period of time, only time will tell. Yet the one thing I can say for certain; is that it’s going to be one hell of a fun ride. Part Two) ELEGANT BUT FUN: Now, while I’m on the topic of fun, I’d like to draw your attention to the current creative team, Adam Glass and Bernard Chang. Or to be more specific about it, how they’ve managed to establish a certain style of storytelling since taking over this book! Essentially, I'd say their style is one part fun, one part plot, and at least three parts personality and charm. Which, in Adam’s case, means that he's able to structure his stories so they can be easily expressed in a sentence or two; whereas, in Bernard's case, this means he can produce a very bold and expressive series of illustrations' that's very dynamic to follow! Collectively, though, the two of them surprisingly have one thing in common, which is that they largely sculpt their wares so personality and emotion take precedence over plot. 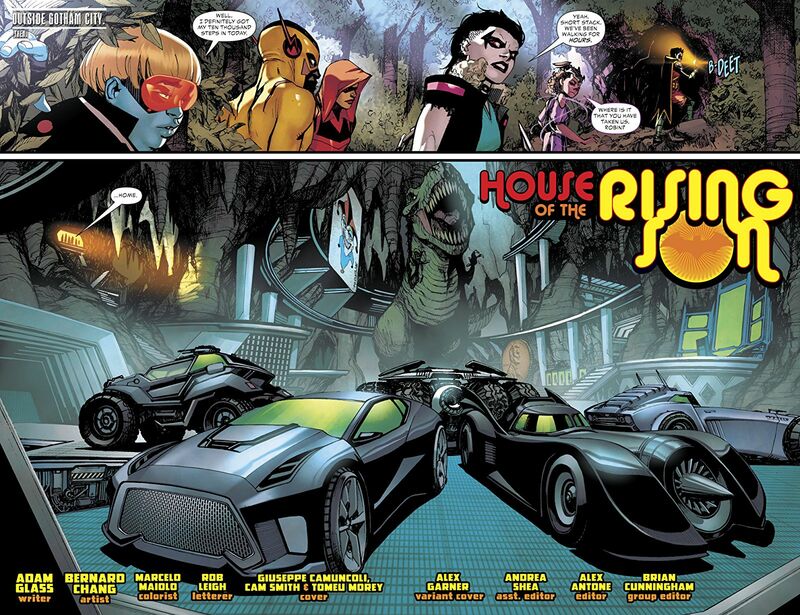 Now, a good example of this can be seen in issue 26 of the Teen Titans, entitled, ‘House Of The Rising Sun’, because Adam’s plot can basically be summed up in a few simple words (the team has to break into the Batcave so they can get something they want), while Bernard’s amazing, outstanding, and top-notch artwork is... is... is? Well, it just is, Ok? And perfectly complements a story that’s chock full of fun characters and fun characterizations. I mean, just take a look at that intense confrontation between Damian and Alfred, for instance, and you can clearly see that Alfred has the upper hand -- verbally, at least -- whereas Damian only has the upper hand if he ever had to take him down (which, of course, would never happen! No matter the situation). Along similar lines, I also enjoyed the reactions of the other members of the team when they thought they were being attacked by Batman. Seriously, folks, this section of the story was a right blast to read, Ka-Pow!, and goes to show that sometimes you can have some fun at someone else’s expense, especially when the final pay off was more of a double-bluff than anything else. That said, however, the one thing about this episode I wasn’t too keen on -- please note, I did say 'one' -- mainly revolves around Damian presuming that Jason Todd has somehow double-crossed him (due to the team's recent failures). Which, in all fairness, seems slightly plausible, up to a point, but not entirely logical when you take in the bigger picture. Anyway, that’s enough of my mad ramblings for the moment. So, what did you think of this issue? Did you like it? Did you hate it? Or like me, did you think that it was an enjoyable adventure that’s both simple and sublime at the same time? Also, how did you feel about Red Arrow knowing more than we initially were led to believe? Personally, I thought it was a nice little twist, and to some degree, kept in character to who she is as a hero. So, when you can, please let me know your thoughts in the comment section below. Did you know that the name of this episode was taken directly from a great song performed by the 60s rock group, ‘The Animals’? If not, don’t worry, because now you’re going to listen to the song in question: 'House of the Rising Sun', which is this month's musical match-up. Now, without giving too much away, a large portion of this story relied on Roundhouse successfully being able to set up a remote connection between the Bat-Computer and himself. Which, in practical terms, means that he needed software. This software. Want to see how Damian and Jason resolve their differences. Want to see Ryan Benjamin’s brilliant artwork, which tonally complemented Bernard’s work on this book. Want to see Joy Stick’s first appearance in the DCU, which was fairly enjoyable, in part, particularly his interesting interactions with Djinn. Want to give some money to DC Comics in exchange for a fun multi-chapter annual. Want to see how this month’s episode will tie together with next month’s episode. Want to spend some more time with the Teen Titans.